How would you describe this garden? 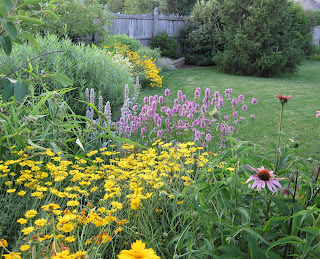 By the names of the flowers - coneflowers, statis, coreopsis? By what is there - flowers, lawn, evergreen, fence? Or would you describe it by how it makes you feel -- peaceful, pretty, serene? I believe that the gardens that really make an impression on us, that make us want to return to them again and again are those we describe with feelings, not by what grew there. I believe that most gardeners, who have gardened for awhile, are planting to achieve a feeling, too, rather than to have a particular plant. Of course, we have our favorite flowers and colors and shrubs and other garden elements and we include them in our gardens. But how put them together to create a garden that we can feel is what really matters. I believe that this is the season that I'm going to pay more attention to how my garden makes me feel than worry about what I plant in it. This is an important point. We remember how things make us feel longer and more strongly that what that thing is/was. I think you are exactly right. We might like a particular plant we see somewhere but, for me anyway, it is much more the overall feeling I remember. When we bought our new apartment, my husband asked me if I thought it would be a good investment (he hadn't seen it when we bought it), and I - to his bemusement - replied that I thought it would make a wonderful home for us. A wonderful post on a topic so many of us can relate to. I garden because the colors bring me joy, I feel harmony as I participate in the symbiotic relationships of living things and I feel serenity during the little moments of quiet and calm in my gardens. I think I have achieved a peaceful garden- after work I just need to step out the door and a peaceful feeling envelops me. I think you are quite right Carol. 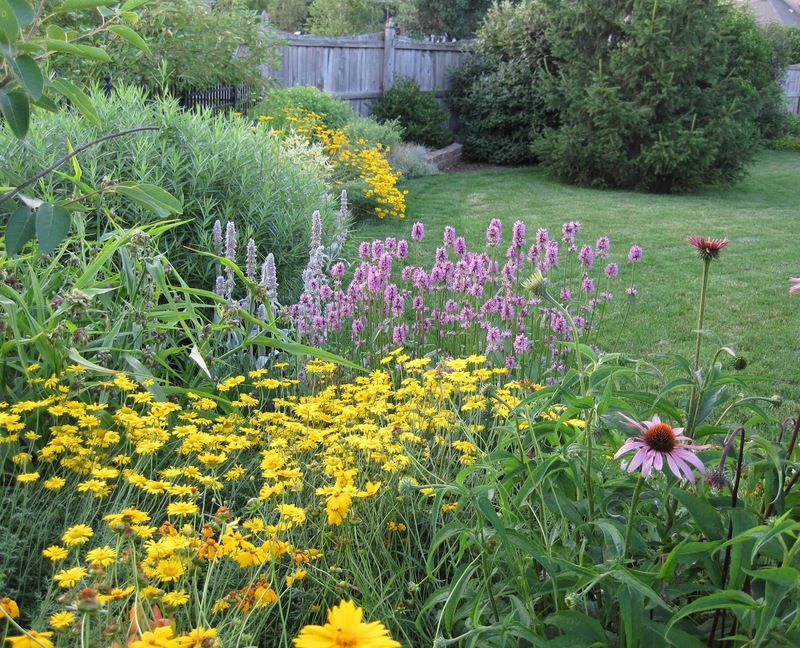 It is that "feeling" that sticks with us when we tour a garden. You have to feel good in your own garden before anyone else can feel something there. Wow good reminder. I am just starting to really garden and so often I focus on the plants I like and not how they will make me feel all together.